The University of the West of England are running an interesting science writing competition and asked a bunch of writers for their tips for potential entrants. Here are mine. When you’re really into a topic, it’s easy to think that everyone else will be and it’s hard to narrow it down to just a few aspects – everything is so fascinating. I have to cover all the bases to do it justice. (This counts double if you’re coming from an academic background). Take a few moments before you start writing to think: what is my story really about? What is the one take home message that I’d want a reader to get from my story, even if they only skimmed it or read a bit? If you were to sum up your story in a sentence or two to explain to a friend or your mum – what would that be? In film and business, they talk about the ‘Elevator pitch’ – you catch the executive in the lift, and in the one minute between floors you succinctly pitch your idea – enough to give a taste of what the story is about, what’s fascinating about it, why it’s important and how you’re approaching it – why it’s worth them investing. It’s the same principle in writing. More than anything, it helps you, the writer, stay focused and clear on the purpose and point of your story, in your writing, research and interviews. Your readers – and editors – will be thankful for it. A few months ago, I found my 2006 Masters dissertation among some old files. Submitted as part of my Masters degree in Science Communication at Imperial College London, it’s about Japan’s history with nuclear science, both as a source of atomic weapons and a solution to Japan’s ever-present energy problems. Re-reading it, it’s amazing how it holds up nearly 10 years on. Many of its themes are still relevant in 2015. Post-Fukushima 2011, Japan is again in the midst of major public distrust over nuclear power. With 2015 also marking 70 years since the Hiroshima and Nagasaki bombings, and the structure of Japanese science in question following the 2014 STAP scandal, I thought others might find it interesting to read, so I posted it on Medium. The post is my original 2006 text so of course some things will have moved on. I’d welcome any updates, thoughts and discussions in comments. Last Sunday I attended a Guardian Masterclass on building online communities. On the work dollar of course, and all for the sake of the project we’ve been working on for over a year. The final sessions in my social media series introduced the many new networks on the scene and a closer look at one often forgotten as a social network, yet one of the biggest websites on the planet. What’s the next big thing? Branch, Medium, App.net etc. What happened to the oldies? Friends Reunited, Myspace, Bebo, Friendster etc. A guide to one of the biggest, most influential social networks. It is of course the biggest video sharing/hosting site in the world and actually the second-biggest search engine (after Google) too. Hosted by the Wellcome Trust’s Multimedia Producers Barry Gibb and Chris Chapman, this session gave a practical overview of the platform and many of the social functions people may not know about, as well as a discussion of how people are using it, how we’re using it for the Trust, Wellcome Collection, Wellcome Library and a chance to watch some of the best and most entertaining videos on the web. You can see presentations and crib sheets from the entire social media series of talks here. Between December and May this year, my spare time has been spent working furiously on a book. 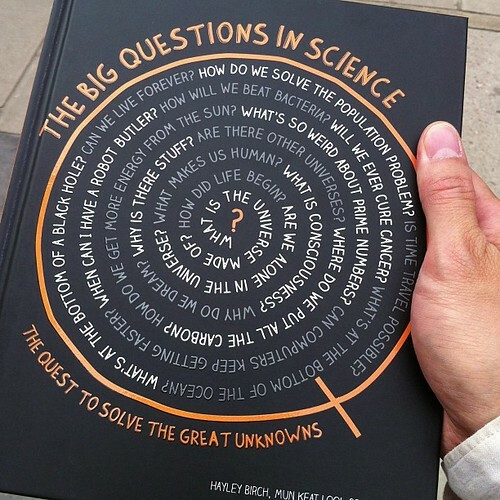 The Big Questions in Science: the quest to solve the great unknowns is a popular science coffee-table book looking at, well, exactly what it says. You can read more about it in this feature we wrote for The Observer. The book is a joint effort between myself and two friends and fellow science writers, Hayley Birch and Colin Stuart, and it’s now available to buy in hardback to decorate your fine shelves, prop up your wonky tables and, of course, entertain and enlighten you with our fine prose. The book came about after the three of us pitched similar ideas through our agent and our publisher, Carlton Books, were interested enough to take a punt. The subject matter is inherently fascinating, giving an excuse to delve deep into questions we ourselves would like to know the answers to. And given how I spend much of my day job editing or in meetings, it was GREAT to exercise my writing muscles, particularly at a decent length and for such interesting topics. As part of my work on a new long-form publication, I’ve been doing a lot of long-form reading. I’ve been scribbling notes about various articles here and there and figured I might as well start collating them centrally on this blog. So here’s note number one. I very much enjoyed this piece by James Palmer in Aeon last week. It is pretty long and not exactly narrative based, but more of a long, very interesting essay, taking us on a journey through history, culture, ethics and pharmacology. He has a few anecdotes scattered around from interviewees but on the whole this is Palmer’s thesis (and indeed, it is a little like a dissertation) and an excellent explainer of what is and where it is today. The difference between a traditional feature, an essay, and a ‘narrative-based’ story (the latter of which is maybe what we think of most as long-form) is an interesting question I’ve been pondering. For me, this feature succeeds because of its breadth; it is in-depth, it has been researched thoroughly and the author clearly has a structure for his thesis. Sure, it’s lacking that ‘story’ spine that might keep people from wandering after the first 1000w or so, but the subject matter and writing is interesting enough, I think, to make it worth your while.